Antiwar Graphic Design. Words & Images From Courageous Life Of Collage Artist Activist John Heartfield. John J Heartfield Collection is a growing collection featuring never-before-published illustrated postcards, letters, notes, and much more from the collection of John Heartfield’s grandson. The collection gives Heartfield’s life story in a very personal way. John Heartfield’s words and drawings were carefully preserved by his son, Tom George Heartfield, the father of the Exhibition’s curator. Heartfield Archive is an expanding collection of important historical documents and published correspondence. 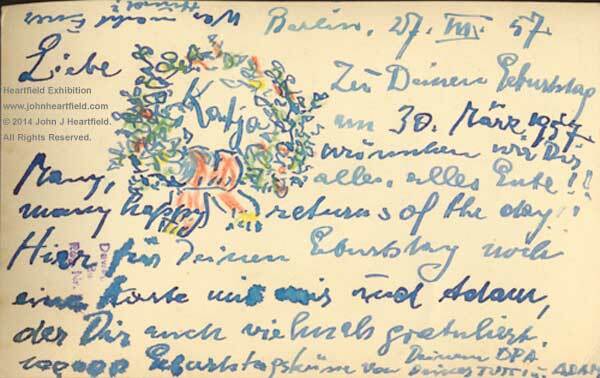 Postcard from John Heartfield (OPA) to his granddaughter in America, Catherine Jacobson (Katja), on the occasion of her ninth birthday (March 30, 1957). Note how Jonnny “montaged” his beloved dog, Adam (Below is the front of the postcard) into a playful birthday wreath for Katja. This section is a collection of letters, illustrated postcards, and documents. They tell the story of an artist whose antiwar graphic design helped define art protest. All great artists are courageous. Some political artist are heroes. Heartfield rose to number-five on the Gestapo’s Most Wanted List for his art as a weapon against The Third Reich.Heartfield was a pioneer in collage, graphic design, and theatre stage set design. His multimedia collages have been described as precursors to visual content on the Internet. His early use of mixed media is echoed in almost all aspects of modern advertising.In addition, John Heartfield was a notable participant in the most vital social and political events of the twentieth century. His temper was legendary. He considered any injustice as a personal attack. Yet, he was a loving family man with a joyous appreciation of life and wonderful sense of humor. It was his humor that made his anti-Nazi photomontages so effective. 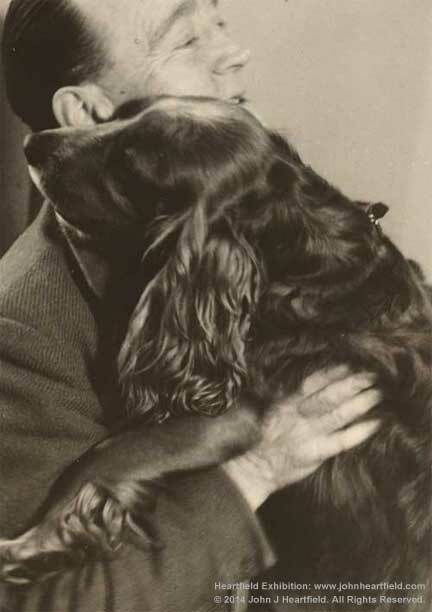 John Heartfield’s grandson, John J Heartfield, the exhibition’s curator, is pleased to continue to share never-before-published letters, illustrated postcards, poems, and more from The John J Heartfield Collection. In Life As A Fighter -> Words & Images -> Heartfield Archive, visitors may view important historical documents and previously published correspondence.